Back in May I wrote about Wii Fit suggesting it would be an excellent tool for older people and those suffering from Alzheimer's disease. The game satisfies two needs: social interaction and exercise. Recently, I am reading articles about how Wii is being adopted by Senior centers and assisted living facilities all across the country. The game of choice seems to be bowling. Wii bowling provides moderate exercise and allows groups to get together much like they would at a bowling alley. Nintendo offers hundreds of games that can be played with Wii. You can exercise your body and even exercise your brain with Wii Brain Academy. The Wii game Wii Fit Plus would be particularly effective for both the person that has Alzheimer's and their caregiver. I know from personal experience with my mother that exercise is both necessary and important. I have written here many times about the immediate positive effect exercise has on my mother. Alzheimer's caregivers could use this tool to improve socialization by inviting friends and neighbors over to play along. Friends and family of caregivers, Wii is a great gift. Perhaps you could consider "chipping in" and purchasing this for a loving caregiver or suffering family member. I'll promise you this--you won't regret it. You could also consider MY Fitness Coach. Don't get detered by the name of the game. If you are older you can sit in a chair while mimicking the majority of the exercises. 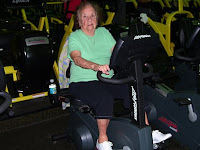 My mother is 94 years old, suffers from Alzheimer's disease, and she can do it. My Fitness Coach is like having a personal trainer right in your home. You can get coaching on 500 exercises including strength training, cardio fitness, and flexibility training. The game includes includes nine different environments and music. I believe Wii is a wonderful tool that can be used by caregivers to satisfy personal and caregiving needs. Wii could improve your day. There are hundreds of games--so you can have fun. Both you and the person you are caring for will benefit. Organized exercise designed to increase strength, flexibility, mobility and coordination may improve overall physical function among nursing home patients with Alzheimer's disease, researchers report. Alzheimer's disease patients who have physically deteriorated are less able to perform activities of daily life, which, in turn, affects their quality of life. Despite the well-known physical benefits obtained from exercise, Professor Alejandro Lucia and colleagues in Spain found comparatively little research has focused on exercise training among patients with Alzheimer's disease. To address this, Lucia, of the Universidad Europea De Madrid, and collaborators compared the outcomes of 16 Alzheimer's disease patients who were randomly assigned to receive normal care involving no programed exercise or to a12-week exercise program as part of their nursing home care. Each group consisted of five women and three men of similar functional capacity at the start of the study. Participants' average age was 73 years in the normal care group and 76 years in the exercise group, the investigators report in the International Journal of Sports Medicine. Lucia's team reports the exercise group had significant improvements in measures of upper and lower body strength and flexibility; agility and balance; walking abilities; and endurance. Exercise participants also showed greater ability to independently perform activities of daily living such as rising from a chair, transferring from bed to chair, bathing, or dressing. These findings show that shorter duration exercise programs "are sufficient to induce significant improvements in patients' functional performance and independence," the investigators state. Adherence to the training program was nearly 100 percent, they add. While more evidence of efficacy is needed from larger study populations, Lucia and colleagues suggest similar programs could be included in the overall nursing home care of Alzheimer's disease patients. Bob DeMarco is the editor of the Alzheimer's Reading Room and an Alzheimer's caregiver. Bob has written more than 4,000 articles with more than 332 ,000 links on the Internet. Bob resides in Delray Beach, FL.